While I love it when we get to touch upon topics of historical significance, maybe my enthusiasm in this case should be reconsidered. 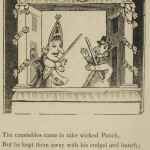 The popular Punch & Judy puppets (see here and here for more) have been around for centuries, and immortalized in countless ways. 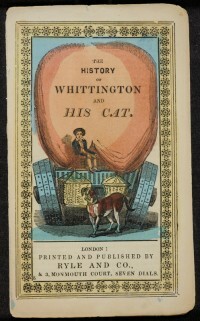 In chapbook form, however, the classic tale loses the absurd comedic effect that usually comes with the live show. 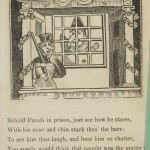 “In my opinion street Punch is one of those extravagant relief’s from the realties of life which would lose its hold upon the people if it were made moral and instructive…. I regard it as quite harmless in its influence and as an outrageous joke which no one in existence would think of regarding as an incentive to any kind of action or as a model for any kind of conduct. Seems like Dickens would’ve been pro-video-game. 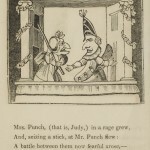 My knowledge of Punch & Judy comes from the Marx Brothers’ Monkey Business, and the 1940 version of Pride & Prejudice (with the inimitable Greer Garson and Lawrence Olivier); I’m sure the rest of you have your own references. 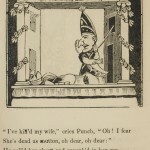 Our copy of The Serio-Comic Drama of Punch & Judy sits in the Rosalynd Stearn Collection in the McGill Rare Books Library. This entry was posted in The Collection by Allana Mayer. Bookmark the permalink. MLIS '14; Digitization student assistant for the RBSC.